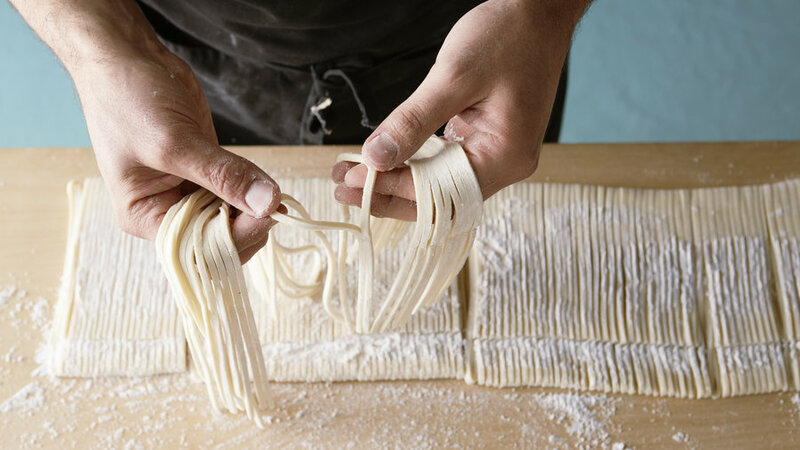 Making udon from scratch can be a little tricky, but it’s a fun project, and even if your first efforts look a little rustic, they’ll still taste good. Once you get the hang of it, you’ll be able to turn out supple, springy noodles worthy of a restaurant. 1. Whisk salt in 1 cup plus 1 tbsp. warm water until salt dissolves; let cool to room temperature. 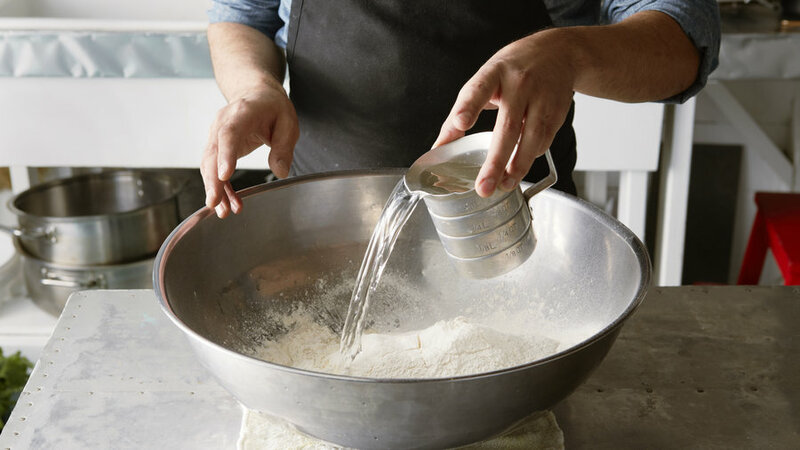 Sift flour into a mound in bowl and set bowl on a damp towel to keep it steady. 2. Pour 3/4 cup salted water in a circular motion over flour. Mix immediately (see next slide). * Find kyorikiko at most Japanese markets, and 00 at well-stocked grocery stores and Italian markets. Kyorikiko produces the springiest and whitest udon. 00 flour is the most similar. All-purpose works, too, but the noodles will be off-white. 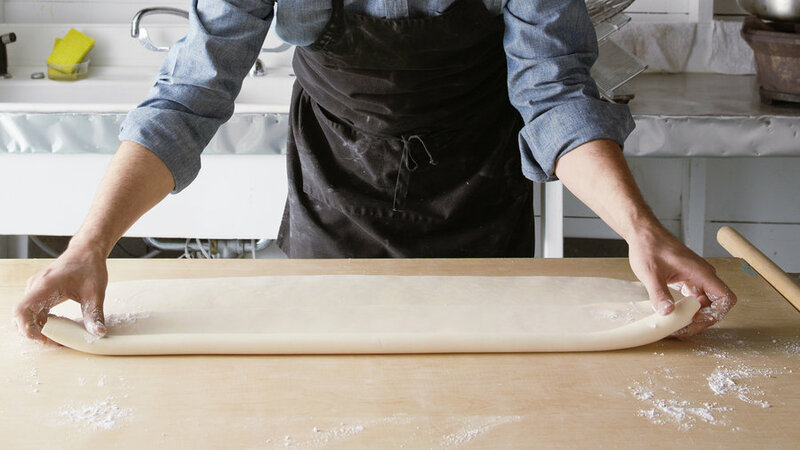 Spread your fingers and move both hands together rapidly in a figure 8 to mix flour and water quickly and evenly (it’s crucial to move fast; otherwise udon will have dry spots and may crack). As you mix, sweep sides and bottom of bowl to blend in any dry patches. When flour looks like cornmeal, add remaining water. Mix as before; it will begin to clump (see photo). Again sweep bowl to mix in any dry patches, and mix until a dough starts to form. 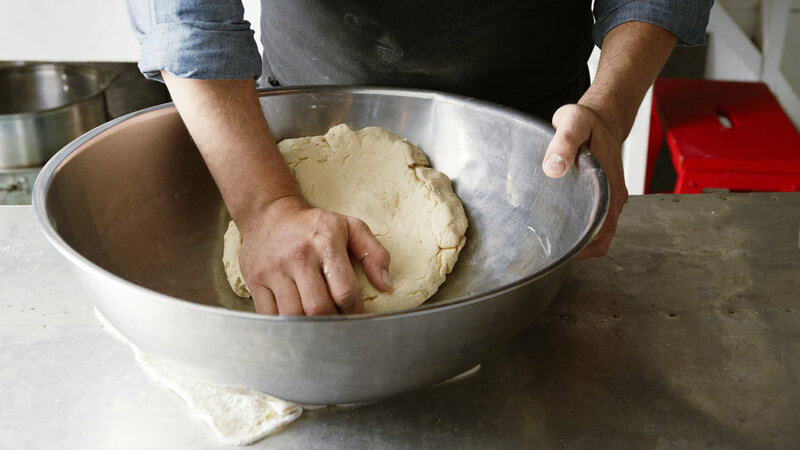 Knead the dough aggressively in the bowl, using the weight of your body (it helps if the bowl is below your waist). It will be quite firm. Knead 5 minutes and shape into a ball. Place in a plastic bag. Squeeze out air and smash ball into a pancake shape about 5 inches in diameter. Let rest 30 minutes at room temperature. 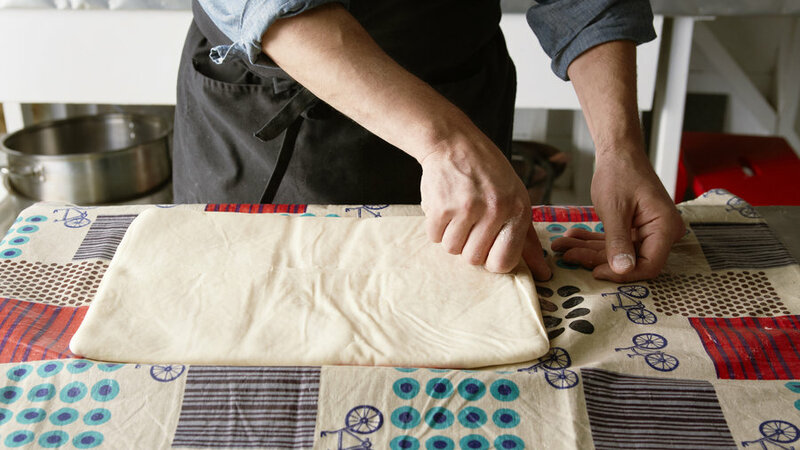 Sylvan Mishima Brackett uses oilcloth to wrap the dough for kneading; however, some oilcloth can contain toxins, so he suggests using doubled resealable plastic bags. Slide bag with dough into a second resealable bag. Seal both bags, pressing out all the air. Wrap in a large kitchen towel. Lay dough package on a clean mat on the floor. Remove your shoes. Using your feet (with clean socks! ), press dough from center to edges of bag, taking tiny shuffling steps (don’t lift your feet) and rotating as you do so. Use sides of your feet, too, to help press evenly. 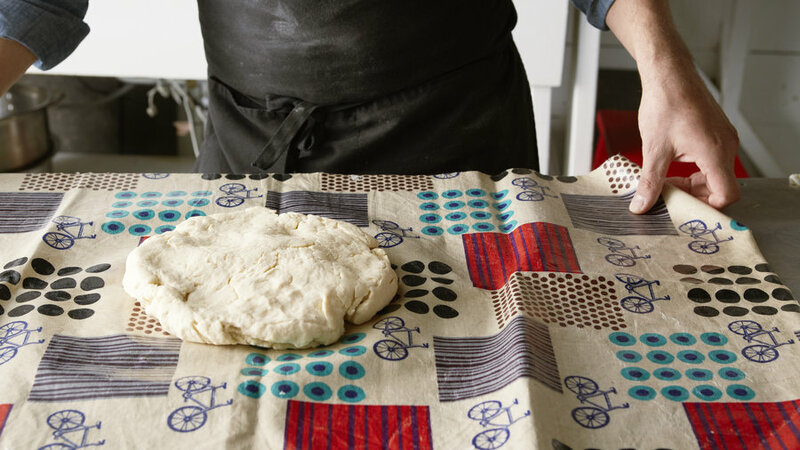 Continue working dough with your feet until it’s pressed into all sides and corners of bag. Remove dough from bag and fold it in thirds, like a letter. Slide back into bag and rewrap with cloth. Repeat kneading, then again fold dough into thirds, wrap and knead again. Let dough rest 2 hours at room temperature. Then fold into thirds and knead a fourth and final time. Chill dough overnight, still bagged, and up to 3 days. After chilling, bring dough to room temperature so it’s pliable. Dust work surface generously with potato starch. 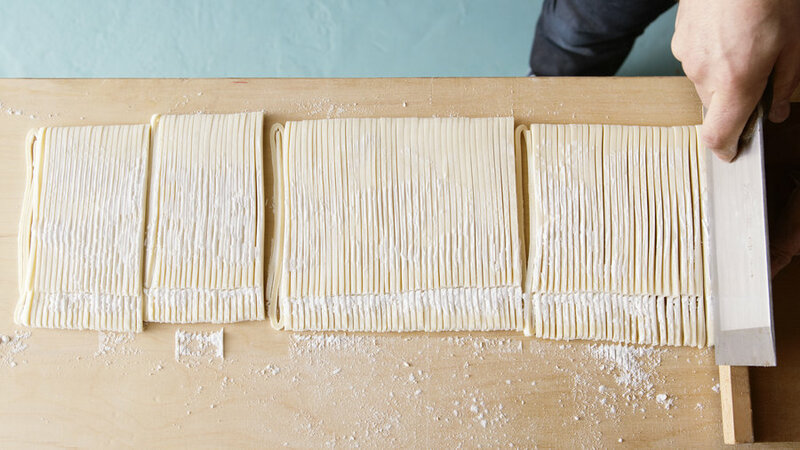 Unwrap dough, dust its surface with starch, and stretch it into a rectangle. Meanwhile, bring a large pot of unsalted water to boil (plenty of water will help the noodles come to a boil quickly and keep from sticking). Place pin on one end, roll once to tuck end under, and wrap dough around pin by rolling it away from you. 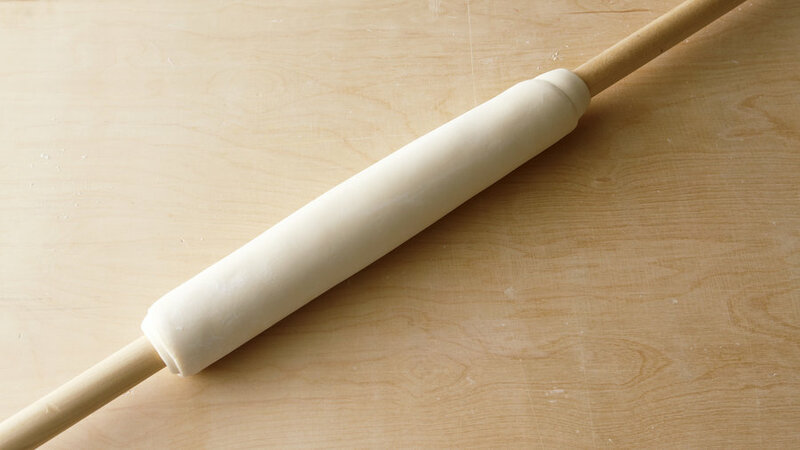 As you roll, move your hands along the dough to the ends of the pin, applying gentle pressure to stretch out dough. Then, unroll dough, moving your hands to the ends as before. Repeat rolling, unrolling, and stretching, dusting with starch as needed to keep dough from sticking, until dough is 1/8 in. thick; try to keep a rectangle shape (you can tug it gently with your hands to help). Dust dough heavily with potato starch. Starting with 1 long side, fold a third of dough into center. Fold in opposite long side, like a letter; you should have a long rectangle about 4 in. wide. Trim short ends even. Using a long, sharp knife and positioning it exactly perpendicular to the dough (otherwise noodles will have a bend at the fold), slice udon a scant 1/4 in. wide. Lift noodles to unfold, shaking off excess starch, and coil into 3/4-lb. bundles (each serves 4). To keep noodles up to 3 days chilled or up to 3 months frozen, dust them with potato starch before coiling and place bundles in a cloth-lined airtight container (no more than 2 layers, separated by a clean dry kitchen towel). To cook the udon, drop 3/4 lb. at a time into boiling water, let return to the boil, and cook until chewy-tender and no longer white in the middle (cut one open to test), 8-12 minutes. Scoop into a large bowl of cold water (ice water if you will be eating them cold) and swish vigorously to remove potato starch. If still sticky, drain and wash a second time. To use in soup, dip in hot water and then add to bowl.